Preoperative Evaluation of patients with eyelid lesions is much the same as patients with eyelid deformities. When a malignancy is suspected however, evaluation of regional lymph nodes and/or possible metastasis (spread to distant sites) may be performed. As with the treatment of any other eyelid abnormality it is imperative that all patients have a thorough examination of their eye. This starts with a measurement of the visual acuity. A complete examination of the ocular surface, tear film and contents of the eye is performed. 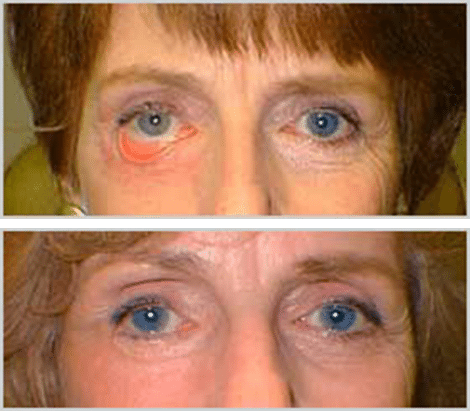 Occasionally, eyelid cancer can occur in systemic illness which must be addressed. Surgery for eyelid lesions is individualized to the patients particular deformity. Frequently, patients are asked to arrive 1-2 hours prior to surgery. This allows the nursing staff to draw appropriate lab work, start an IV and answer any further questions you may have. An anesthesiologist will discuss anesthesia prior to surgery and answer any questions you may have. It is not uncommon in the reconstruction of eyelid deformities to need to graft tissue from one part of the body into the eyelids. Common donor sites include the oral mucosa, skin from behind the ear, skin from the eyelid, cartilage from the ear or nose and fascia (tough fibrous tissue) from the lateral thigh. Postoperative care after excision of eyelid lesions is individualized to the patients specific abnormality. It is not uncommon to be instructed to leave an eye patch on for 24 hours. The wounds patient may be instructed to clean the wounds with sterile saline solution or hydrogen peroxide twice daily and antibiotic ointment placed on the wounds. Many patients are treated with oral antibiotics for 5-7 days after surgery. A follow up appointment with your physician will be scheduled within 5-7 days. Eyelid surgery is very safe. Bruising and swelling are common and usually subsides within 1-2 weeks. Inability to close the eye is also common during the first 1-2 weeks. Significant scarring and pain are unusual as is infection. As with any surgery in and around the eye, there is a risk of loss of vision. Most experts believe that this risk is approximately 1/40,000. Any significant postoperative bleeding, pain, redness or visual disturbances must be reported to your physician. Most eyelid surgery is performed in the office or as an outpatient under local anesthesia. Complications are very rare and include: bleeding, infection, bruising, swelling, inability to close the eye, scarring and loss of vision. Because we have a unique understanding of the eye and plastic surgery, we are frequently asked to correct eyelid deformities in other surgeon’s patients with sub optimal results.